A new billboard has been erected in Toronto on the Gardiner Expressway that gives a clear indication to those who text and drive. Wathan Funeral Home, which is a fake funeral home dreamed up by media agency John St. and Cieslok Media, is responsible for the ad, or in the company’s mind, a public service announcement, that encourages drivers to be safe and keep focussed on the road, rather than incoming text messages. 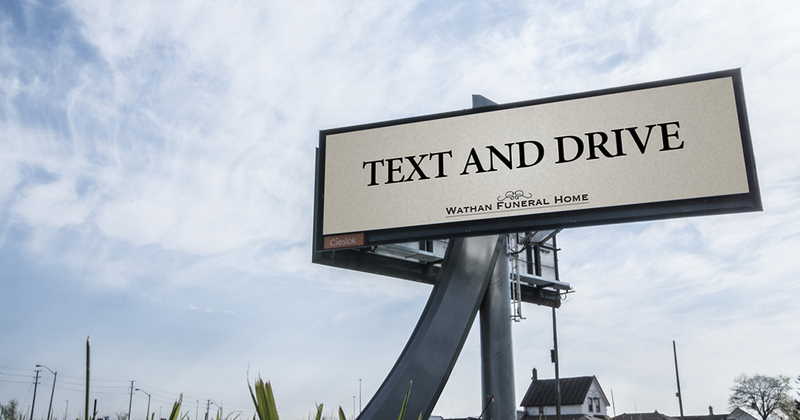 While the ad is a bold move, the Text and Drive letters are massive and drivers passing by might not see the small print of the fake funeral home’s business name, giving the PSA a rather morbid tone. “If you’re here, you’ve probably seen our “Text and Drive” billboard. And if you have, you probably came to this website to tell us what horrible people we are for running an ad like that. And you’d be right,” said a statement on its website. The Government of Ontario banned the use of a mobile device while driving in 2009. Fines recently increased to those caught using their handheld device – such as a smartphone, tablet, laptop, MP3, DVD player – while driving to a minimum of $490.